MacDonald Dettwiler (MDA) is developing a space mission around a new generation of smaller cost-effective satellites. CASSIOPE (Cascade SmallSat and Ionospheric Polar Explorer) is a multifunctional mission designed to serve both a scientific and a commercial purpose. 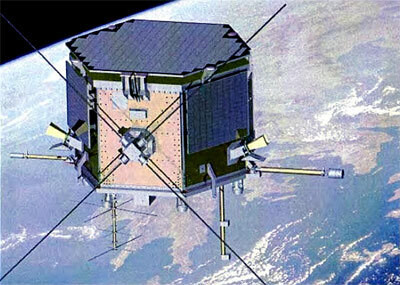 Scheduled for launch in 2007, this small satellite mission will feature the first in a new generation of multi-purpose satellite platforms that will be adaptable for use in a variety of future Canadian space missions. MDA is the prime contractor for the space and ground infrastructure for the CASSIOPE Mission including system engineering, design, assembly, integration, testing, launch and operation of the spacecraft. The CASSIOPE Mission will carry the experimental Cascade payload to demonstrate the world's first commercial space-based digital courier service. When proven, future operational missions will provide a large-scale data transfer service to remote commercial, civil and military clients anywhere in the world. Similar to the operations of a traditional courier company, Cascade will pick-up a parcel at close of business day, and deliver it to geographically dispersed destinations before work starts the next day. The difference is that the service will utilize a small satellite and the packages will be very large digital data files. Initially, one Low Earth Orbit satellite will orbit above the Earth at an altitude of 300 to 1,500 km once every 1.5 hours, providing multiple opportunities each day for the pick-up and delivery of data anywhere on Earth. As demand increases, capacity can be expanded by adding additional satellites. Cascade is accessed through small turnkey terminals with built-in mass storage capacity and 1-2 meter antennas. The terminal communicates with the Cascade control centre to schedule pickup and confirm delivery. As the satellite comes overhead, the data is transmitted at 1.2 gigabits per second - 12 times faster than the operating speed of most office LANs. At that speed, the contents of a typical music CD would be transferred in a little over 4 seconds and a full length DVD movie in little more than a minute. This point-to-point delivery system ensures a high degree of security. CASSIOPE will operate in the higher frequency Ka-Band radio spectrum providing greater bandwidth. Developed by a scientific team led by the University of Calgary, ePOP will be Canada's first space environment sensor suite, providing Canadian scientists with the opportunity to understand the impact the variability of the Sun has on the space environment. ePOP will carry a suite of eight scientific instruments, including plasma sensors, radio wave receivers, magnetometers, CCD cameras, and a beacon transmitter. The ePOP payload will lead to a comprehensive understanding of plasma processes in the polar ionosphere – a region in the upper atmosphere. In February 2018, ESA and the CSA made a deal to add CASSIOPE 1 with its ePOP payload as the fourth member to the Swarm constellation. CASSIOPE 1 is refered as Swarm Echo"